If handled correctly the combination of the most disparate components can produce truly striking results. most often associated with technology brands like JVC and the livery on police cars. each of the font characters to convey the desired impression of strength, luxury and presitge. Then a range of icon ideas were explored, evaluated and discarded before finally selecting the horizon motif. 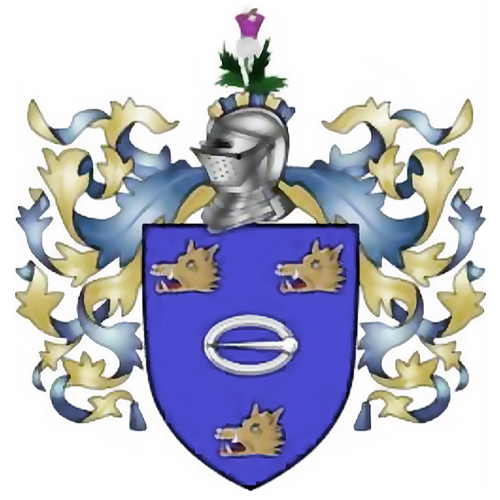 and delivered a direct and personal link to the owner’s heraldic family identity. 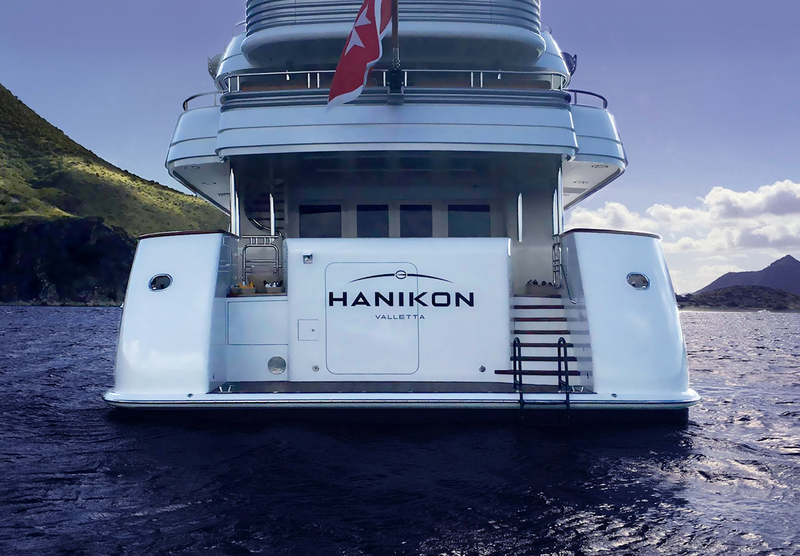 The 50m Feadship motor yacht HANIKON went into new ownership at the end of last year’s busy Mediterranean season. and a full upcoming Caribbean charter calendar. and the evident delight of the owner are enough to vindicate that decision. We will certainly use Brandgarden again. 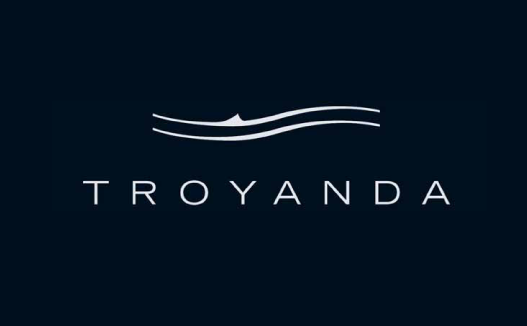 The yacht had previously sailed under the name Troyanda shown below. and it was judged that a much bolder typeface was required. The brief for development of Hanikon’s new identity contained a suggestion to use the font Eurostile. of alternative sans typefaces in a variety of stroke thicknesses. Each font that was examined provided a number of design cues to customise the shape of each one of the letters that make up the new logo. The objective was to find every means to move the font away from looking utilitarian and towards conveying luxury. it was desirable for the new bolder identity to contain a pictographic element, ideally to be derived from a reference to the sea. In addition the client also very much wanted to include the buckle motif from the family’s crest. to arrive at the optimum identity and to fully answer all the requirements of the brief. 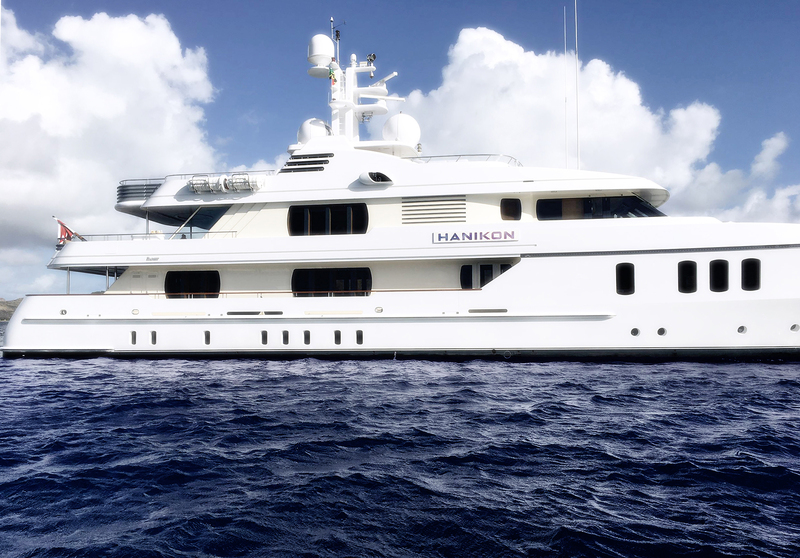 The elegant lines of the yacht provided two long narrow nameplates on the sides of the vessel. 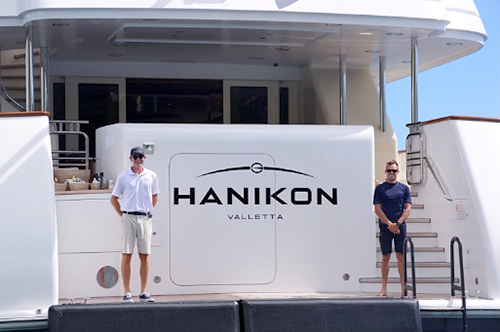 Therefore the only position on the yacht where the new Hanikon logo could be shown in it’s entirety was across the stern of the vessel. a regular occurrence, in the most exclusive ports in the world, when image is everything! 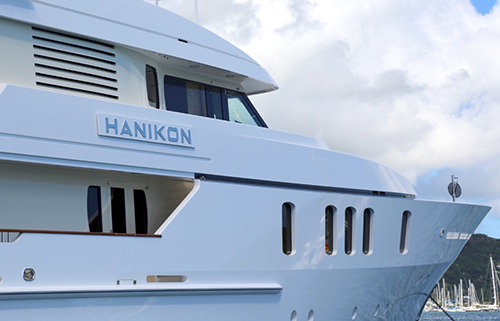 The difficulty is that on Hanikon the transome door is offset to the left/portside of the vessel. the logo to be as large as was possible whilst also being perfectly centred. The attached document shows the precise calculations necessary to achieve a perfectly balanced end result.